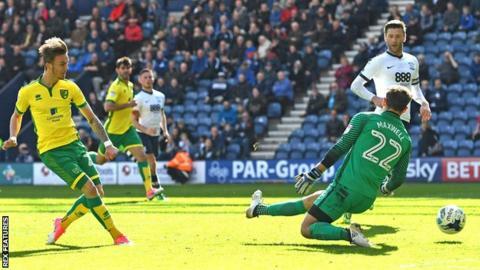 Norwich City eased to victory over Preston North End at Deepdale on an afternoon that the Canaries' slim Championship play-off hopes were ended. Fulham's victory over Aston Villa in the early kick-off was enough to put a top-six finish out of Norwich's reach with three games remaining. Josh Murphy pounced to put Norwich 2-0 up after Graham Dorrans' deflected finish had opened the scoring. Thomas Spurr pulled one back, only for James Maddison to add a third late on. Defeat also put Preston out of top-six contention as they fell two points behind Norwich - a side they have failed to finish above in the English football pyramid since the 2009-10 season, when the Canaries won promotion from League One as champions and the Lillywhites finished 17th in the Championship. Dorrans gave the visitors the advantage with a 25-yard strike that took a slight deflection on its way to beating Preston goalkeeper Chris Maxwell to find the bottom corner. A flicked pass back from Cameron Jerome allowed Murphy time to pick his spot and double the lead before the break, while Aiden McGeady went closest to hitting back before half-time with powerfully struck shot wide. Both sides had chances after the break and Spurr gave Preston hope, heading home from Paul Gallagher's free-kick, before the hosts twice threatened to level as John Ruddy foiled Tom Barkhuizen and Paul Huntington headed wide. Maddison, however, put the result beyond doubt with his first senior goal for the club. "We left ourselves too much to do after the first half. We started well for the first few minutes but after that we were a shadow of ourselves. "We didn't have any energy about us; we didn't stop the opposition from playing and they have some very talented players. "Half-time is the angriest I've been for a long time. I said to the players we want to finish the season strongly, and it's a real disappointment because I don't want to finish the season with that kind of performance. Three games to go and we need to do something about it." "I thought it was a really good performance but we could even have had more goals in the first half which would have killed the game off. "Thankfully we got the third goal just before the end. "I like playing gifted, talented, attacking players. We try to get as many out there as we can without having an unbalanced team. I thought to a man the players did really well today." Match ends, Preston North End 1, Norwich City 3. Second Half ends, Preston North End 1, Norwich City 3. Goal! Preston North End 1, Norwich City 3. James Maddison (Norwich City) right footed shot from the centre of the box to the centre of the goal. Assisted by Steven Naismith with a through ball. Corner, Norwich City. Conceded by Chris Maxwell. Attempt saved. Nélson Oliveira (Norwich City) left footed shot from a difficult angle on the left is saved in the bottom left corner. Assisted by Graham Dorrans. Foul by Nélson Oliveira (Norwich City). Andrew Boyle (Preston North End) wins a free kick in the defensive half. Attempt missed. Jordan Hugill (Preston North End) right footed shot from the centre of the box misses to the right. Assisted by Andrew Boyle. Attempt blocked. Daryl Horgan (Preston North End) left footed shot from outside the box is blocked. Assisted by Chris Maxwell. Attempt saved. Jonny Howson (Norwich City) right footed shot from outside the box is saved in the bottom right corner. Assisted by James Maddison. Steven Naismith (Norwich City) wins a free kick in the attacking half. Substitution, Preston North End. Daniel Johnson replaces Callum Robinson. Josh Murphy (Norwich City) is shown the yellow card for a bad foul. Daryl Horgan (Preston North End) wins a free kick in the defensive half. Substitution, Norwich City. James Maddison replaces Alex Pritchard. Substitution, Norwich City. Nélson Oliveira replaces Cameron Jerome. Alex Pritchard (Norwich City) wins a free kick in the defensive half. Attempt missed. Aiden McGeady (Preston North End) right footed shot from the right side of the box is close, but misses to the right. Assisted by Callum Robinson. Foul by Daryl Horgan (Preston North End). Corner, Preston North End. Conceded by Graham Dorrans. Foul by Ivo Pinto (Norwich City). Attempt missed. Paul Huntington (Preston North End) header from the centre of the box is close, but misses to the right. Assisted by Paul Gallagher with a cross following a corner. Corner, Preston North End. Conceded by Steven Naismith. Attempt missed. Jordan Hugill (Preston North End) header from the centre of the box misses to the left. Assisted by Callum Robinson with a cross. Hand ball by Alex Pritchard (Norwich City). Goal! Preston North End 1, Norwich City 2. Thomas Spurr (Preston North End) header from the centre of the box to the bottom right corner. Assisted by Paul Gallagher with a cross following a set piece situation. Thomas Spurr (Preston North End) wins a free kick on the left wing. Foul by Steven Naismith (Norwich City).